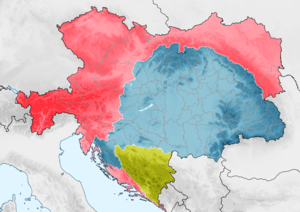 The division between lands to be administered from Vienna (deep pink) and lands to be administered from Budapest (yellow) under the 1867 dual monarchy Ausgleich" agreement. From 1878, Bosnia-Herzegovina (green) was jointly administered. Coronation of Francis Joseph I and Elisabeth Amalie at Matthias Church, Buda, 8 June 1867. The Austro-Hungarian Compromise of 1867 (German: Ausgleich, Hungarian: Kiegyezés) established the dual monarchy of Austria-Hungary. The Compromise partially re-established the sovereignty of the Kingdom of Hungary, separate from, and no longer subject to the Austrian Empire. The agreement also restored the old historic constitution of the Kingdom of Hungary. The Hungarian political leaders had two main goals during the negotiations. One was to regain the traditional status (both legal and political) of the Hungarian state, which was lost after the Hungarian Revolution of 1848. The other was to restore the series of reform laws of the revolutionary parliament of 1848, which were based on the 12 points that established modern civil and political rights, economic and societal reforms in Hungary. Under the Compromise, the lands of the House of Habsburg were reorganized as a real union between the Austrian Empire and the Kingdom of Hungary, headed by a single monarch who reigned as Emperor of Austria in the Austrian half of the empire, and as King of Hungary in Kingdom of Hungary. The Cisleithanian (Austrian) and Transleithanian (Hungarian) states were governed by separate parliaments and prime ministers. The two countries conducted unified foreign diplomatic and defense policies. For these purposes, "common" ministries of foreign affairs and defence were maintained under the monarch's direct authority, as was a third ministry responsible only for financing the two "common" portfolios. In the Middle Ages, the Duchy of Austria was an autonomous state within the Holy Roman Empire, ruled by the House of Habsburg, and the Kingdom of Hungary was a sovereign state outside the empire. In 1526, Hungary was defeated and partially conquered by the Ottoman Empire. King Louis II of Hungary and Bohemia had no legitimate heir and died young in the Battle of Mohács. Louis II's brother-in-law, Ferdinand I of Habsburg was elected King of Hungary by a rump Parliament in Pozsony in December 1526. The Ottomans were subsequently driven out of Hungary by international Western Christian forces led by Prince Eugene of Savoy between 1686 and 1699. From 1526 to 1804, Hungary was ruled by the Habsburg dynasty as kings of Hungary, but remained nominally and legally separate from the other lands of the Habsburg Monarchy. In 1804, Francis II, Holy Roman Emperor, who was also ruler of the lands of the Habsburg Monarchy, founded the Empire of Austria in which all his lands were included. In doing so he created a formal overarching structure for the Habsburg Monarchy, which had functioned as a composite monarchy for about 300 years. (Composite states/monarchies were the most common / dominant form of states in early modern era Europe.) Until the 1848 revolution, the workings of the overarching structure and the status of Hungary stayed much the same as they had been before 1804. The Kingdom of Hungary had always been considered a separate realm, the country's status was affirmed by Article X, which was added to Hungary's constitution in 1790 during the phase of the composite monarchy; it described the state as a Regnum Independens. Hungary's affairs continued to be administered by its own institutions (King and Diet) as they had been previously. Thus, under the new arrangements, no imperial institutions were involved in its internal government. From the perspective of the Court since 1723, regnum Hungariae had been a hereditary province of the dynasty's three main branches on both lines. From the perspective of the ország (the country), Hungary was regnum independens, a separate Land as Article X of 1790 stipulated ... In 1804 Emperor Franz assumed the title of Emperor of Austria for all the Erblande of the dynasty and for the other Lands, including Hungary. Thus Hungary formally became part of the Empire of Austria. The Holy Roman Empire was abolished in 1806. The Court reassured the diet, however, that the assumption of the monarch's new title (Emperor of Austria) did not in any sense affect the laws and the constitution of Hungary. The Hungarian legal system and judicial system remained separated and independent from the unified legal and judicial systems of the other Habsburg ruled areas. While in most Western European countries (like France and England) the king's reign began immediately upon the death of his predecessor, in Hungary the coronation was absolutely indispensable as if it were not properly executed, the Kingdom stayed "orphaned". Even during the long personal union between Kingdom of Hungary and other Habsburg ruled areas, the Habsburg monarchs had to be crowned as King of Hungary in order to promulgate laws there or exercise his royal prerogatives in the territory of Kingdom of Hungary. Since the Golden Bull of 1222, all Hungarian monarchs had to take a coronation oath during the coronation procedure, where the new monarchs had to agree to uphold the constitutional arrangement of the country, to preserve the liberties of his subjects and the territorial integrity of the realm. From 1526 to 1851, the Kingdom of Hungary maintained its own customs borders, which separated Hungary from the united customs system of other Habsburg ruled territories. In the failed Hungarian Revolution of 1848, the Magyars came close to regaining independence and were defeated by the Austrian Empire only by the military intervention of the Russian Empire. After the restoration of Habsburg power, Hungary was placed under martial law. Prime Minister Prince Felix of Schwarzenberg and his government, operating from November 1848, pursued a radically new imperial policy. It wanted to develop a uniform empire in the spirit of the imperial constitution issued by Franz Joseph I in Olmütz on 4 March 1849, and as a result, Hungary's constitution and territorial integrity were abolished. The centralist March Constitution of Austria introduced the neo-absolutism in Habsburg ruled territories, and it provided absolute power for the monarch. The Austrian constitution was accepted by the Imperial Diet of Austria, in which Hungary had no representation and traditionally had no legislative power in the territory of Kingdom of Hungary; still, it also tried to abolish the Diet of Hungary, which existed as the legislative power in Hungary since the late 12th century. The new Austrian constitution also went against the historical constitution of Hungary and tried to nullify it. A military dictatorship was created in Hungary. Every aspect of Hungarian life was put under close scrutiny and governmental control. German became the official language of public administration. An edict issued on 9 October 1849 placed education under state control, the curriculum was prescribed and controlled by the state, the teaching of national history was restricted and history was taught from a Habsburg viewpoint. Even the bastion of Hungarian culture, the Academy, was kept under control: the institution was staffed with foreigners, mostly Germans, and the institution was practically defunct until[clarification needed] the end of 1858. Hungarians responded with passive resistance. Anti-Habsburg and anti-German sentiments were strong. In the following years, the empire instituted several reforms but failed to resolve problems. After the Hungarian revolution of 1848–49, the independent customs system of Hungary was abolished, and Hungary became part of the unified imperial customs system on 1 October 1851. In 1866, Austria was completely defeated in the Austro-Prussian War. Its position as the leading state of Germany ended, and the remaining German minor states were soon absorbed into the German Empire, created by Prussia. Austria also lost much of its remaining claims and influence in Italy, which had been its chief foreign policy interest. After a period of Greater German ambitions, when Austria tried to establish itself as the leading German power, Austria again needed to redefine itself to maintain unity in the face of nationalism. As a consequence of the Second Italian War of Independence and the Austro-Prussian War, the Habsburg Empire was on the verge of collapse in 1866, as these wars caused monumental state debt and a financial crisis. The Habsburgs were forced to reconcile with Hungary, to save their empire and dynasty. The Habsburgs and part of the Hungarian political elite arranged the Austro-Hungarian Compromise of 1867. The Compromise was arranged and legitimated by a very small part of the Hungarian society (suffrage was very limited: less than 8 percent of the population had voting rights), and was seen by a very large part of the population as betrayal of the Hungarian cause and the heritage of the 1848-49 War of Independence. This caused deep and lasting cracks in Hungarian society. Hungarian statesman Ferenc Deák is considered the intellectual force behind the Compromise. Deák initially wanted independence for Hungary and supported the 1848 Revolution, but he broke with hardline nationalists and advocated a modified union under the Habsburgs. Deák believed that while Hungary had the right to full internal independence, questions of defence and foreign affairs were "common" to both Austria and Hungary, under the Pragmatic Sanction of 1723. He also felt that Hungary benefited from continued union with wealthier, more industrialized Austria and that the Compromise would end the continual pressures on Austria to choose between the Magyars and the Slavs of the Kingdom of Hungary. Imperial Chancellor Beust quickly negotiated the Compromise with the Hungarian leaders. Beust was particularly eager to renew the conflict with Prussia and thought a quick settlement with Hungary would make that possible. Franz Joseph and Deák signed the Compromise, and it was ratified by the restored Diet of Hungary on 29 May 1867. The Compromise was negotiated and legitimized by only a very small part of Hungarian society (suffrage was very limited: less than 8 percent of the population had voting rights), and was seen by a very large part of the population as a betrayal of the Hungarian cause and the heritage of the 1848-49 War of Independence. The Compromise was very unpopular and the government resorted to force to suppress civil dissent. The Compromise caused deep and lasting schisms in Hungarian society. Beust's revenge against Prussia did not materialize. When, in 1870, Beust wanted Austria-Hungary to support France against Prussia, Hungarian Prime Minister Gyula Andrássy was "vigorously opposed" and effectively vetoed Austrian intervention. The settlement with Hungary consisted then of three parts: the political settlement, which was to be permanent and would remain part of the fundamental constitution of the monarchy; the periodical financial settlement, determining the partition of the common expenses as arranged by the Quota-Deputations and ratified by the parliaments; and the Customs Union and the agreement on currency, a voluntary, reversible arrangement between the two governments and parliaments. The old historic constitution of Hungary was restored. The Hungarian parliament was re-established (which was the legislative power in Hungary since the 12th century), thus Austria and Hungary had separate parliaments again. Each region had its own government, headed by its own prime minister. The "dual monarchy" consisted of the emperor-king, and the common ministers of foreign affairs, defence, and a finance ministry only for the Common Army, navy and diplomatic expenditures. The Hungarian legal system and Hungarians laws were restored in the territory of Kingdom of Hungary; the traditionally independent and separate judicial systems of Hungary were re-established. Austria-Hungary, as a common entity, had no jurisdiction and legislative power, which was shaped by the fact that there was no common parliament. The common diplomatic and military affairs were managed by delegations from the Imperial Council and the Hungarian parliament. The delegations had 60 members from the Imperial Council, and 60 members from the Hungarian parliament, and the ratios of various political fractions exactly and proportionally mirrored their own political parties of their parliaments. The members of the delegates from the two parliaments had no right to debate or introduce new ideas during the meetings, and they were nothing more than the extended arms of their own parliaments. All common decisions had to be ratified by the Austrian and Hungarian parliaments to be valid. A common Ministry of Foreign Affairs was created, responsible for diplomacy and foreign policy. There was no common citizenship in Austria-Hungary: one was either an Austrian citizen or a Hungarian citizen, never both. Austria-Hungary used two separate passports: the Austrian passport and the Hungarian one. There was no common passport. A common finance ministry was founded, only for the expenditures of the Common Army, the navy and the diplomatic service and for the issue of banknotes. It was headed by the Common Finance Minister. All other expenditures belonged to the Austrian Finance Ministry in the Austrian Empire and the Hungarian Finance Ministry in the Kingdom of Hungary. The Austrian finance minister was subordinated only to the Minister-President of Austria in Austrian Empire, and the Hungarian Finance Minister was subordinated only to the Prime Minister of Hungary. The monetary and economic terms of the Compromise and the customs union had to be renegotiated every ten years. Despite Austria and Hungary sharing a common currency, they were fiscally sovereign and independent entities. International commercial treaties were conducted independently by Austria and Hungary. The Royal Hungarian Honvéd was restored, and the Imperial-Royal Landwehr was created, but both states had to continue to finance the Common Army, much larger than both. A common Austro-Hungarian War Ministry was formed immediately for the large Common Army, but it had no right to command directly the smaller Landwehr and the Honvéd armies, which were respectively placed under the direct control of the separate Austrian and Hungarian Ministries of Defence. The Austrian and Hungarian Ministers of Defence were not placed under the command and jurisdiction of the Common War Ministry; they were subordinated only to their own prime ministers and the respective parliaments in Vienna and Budapest. Hungary took on a large part of the towering Austrian state debt. The King became the supreme warlord, holding all authority over the structure, organization, and administration of the army. He appointed the senior officials, had the right to declare war, and was the commander-in-chief of the army. He had the right to declare a state of emergency. He had the right of preliminary royal assent to every bill the Cabinet Council wanted to report to the National Assembly. He had the right to veto any law passed by the National Assembly. He had the right to dissolve the National Assembly. He had the right to appoint and dismiss the members of the Cabinet Council. This meant a great reduction in Hungarian sovereignty and autonomy, even in comparison with the pre-1848 status quo. The resulting system was maintained until the dissolution of the dual monarchy after World War I. The favoritism shown to the Magyars, the second largest ethnic group in the dual monarchy after the Germans, caused discontent on the part of other ethnic groups like the Slovaks and Romanians. Although a "Nationalities Law" was enacted to preserve the rights of ethnic minorities, the two parliaments took very different approaches to this issue. The basic problem in the later years was that the Compromise with Hungary only encouraged the appetites of non-Hungarian minorities in Hungary that were historically within the boundaries of the Hungarian Kingdom. The majority of Hungarians felt they had accepted the Compromise only under coercion. The Austrian Emperor, separately crowned King of Hungary, had to swear in his coronation oath not to revise or diminish the historic imperial (Hungarian) domains of the Hungarian nobility, magnates, and upper classes. The Hungarians, having been given self-rule and a separate status, only partially acquiesced to granting "their" minorities recognition and local autonomy. In the Kingdom of Hungary, several ethnic minorities faced increased pressures of Magyarization. Further, the renegotiations that occurred every ten years often led to constitutional crises. Ultimately, although the Compromise hoped to fix the problems faced by a multi-national state while maintaining the benefits of a large state, the new system still faced the same internal pressures as the old. To what extent the dual monarchy stabilized the country in the face of national awakenings and to what extent it alleviated, or aggravated, the situation are debated even today. In a letter on 1 February 1913, to Foreign Minister Berchtold, Archduke Franz Ferdinand said that "irredentism in our country ... will cease immediately if our Slavs are given a comfortable, fair and good life" instead of being trampled on (as they were being trampled on by the Hungarians). ^ Robert Young (1995). Secession of Quebec and the Future of Canada. McGill-Queen's Press. p. 138. ISBN 9780773565470. ^ Ferenc Szakály (1980). Hungary and Eastern Europe: Research Report Volume 182 of Studia historica Academiae Scientiarum Hungaricae. Akadémiai Kiadó. p. 178. ISBN 9789630525954. ^ Robert A. Kann (1980). A History of the Habsburg Empire, 1526-1918. University of California Press. p. 611. ISBN 9780520042063. ^ Miklós Molnár (2001). A Concise History of Hungary. Cambridge University Press. p. 88. ISBN 9780521667364. ^ Robert I. Frost (2018). The Oxford History of Poland-Lithuania: Volume I: The Making of the Polish-Lithuanian Union, 1385-1569, Oxford History of Early Modern Europe. Oxford University Press. p. 40. ISBN 9780192568144. ^ Balázs, Éva H. Hungary and the Habsburgs, 1765–1800: An Experiment in Enlightened Absolutism. p. 320. ^ Yonge, Charlotte (1867). "The Crown of St. Stephen". A Book of Golden Deeds Of all Times and all Lands. London, Glasgow and Bombay: Blackie and Son. Retrieved 2008-08-21. ^ Nemes, Paul (2000-01-10). "Central Europe Review — Hungary: The Holy Crown". Retrieved 2008-09-26. ^ An account of this service, written by Count Miklos Banffy, a witness, may be read at The Last Habsburg Coronation: Budapest, 1916. From Theodore's Royalty and Monarchy Website. ^ András A. Gergely; Gábor Máthé (2000). The Hungarian state: thousand years in Europe : [1000-2000]. Korona. p. 66. ISBN 9789639191792. ^ Walther Killy (2005). Schmidt - Theyer, Volume 9 of Dictionary of German biography. Walter de Gruyter. p. 237. ISBN 9783110966299. ^ Július Bartl (2002). Slovak History: Chronology & Lexicon, G - Reference, Information and Interdisciplinary Subjects Series. Bolchazy-Carducci Publishers. p. 222. ISBN 9780865164444. ^ Hungarian statesmen of destiny, 1860-1960, Volume 58 of Atlantic studies on society in change, Volume 262 of East European monographs. Social Sciences Monograph. 1989. p. 23. ISBN 9780880331593. ^ Csohány János: Leo Thun egyházpolitikája. In: Egyháztörténeti Szemle. 11/2. 2010. ^ Sowards, Steven W (23 April 2004), Nationalism in Hungary, 1848–1867. Twenty Five Lectures on Modern Balkan History, retrieved 19 March 2009 . ^ Július Bartl (2002). Slovak History: Chronology & Lexicon. Bolchazy-Carducci Publishers. p. 102. ISBN 9780865164444. ^ Andreas Komlosy (2015). "Imperial Cohesion, Nation-Building, and Regional Integration in the Habsburg Monarchy, 1804-1918". In Stefan Berger, Alexei Miller. Nationalizing Empires. Historical studies in Eastern Europe and Eurasia. 3. Central European University Press. p. 398. ISBN 9789633860168. ^ Seton-Watson, R. W. "The Austro-Hungarian Ausgleich of 1867." The Slavonic and East European Review 19.53/54 (1939): 123–40. ^ Good, David F. The Economic Rise of the Habsburg Empire, 1750-1914. 1984. p.82. ^ Tihany, Leslie C (1969). "The Austro-Hungarian Compromise, 1867-1918: A Half Century of Diagnosis; Fifty Years of Post-Mortem". Central European History. 2 (2): 114–38. doi:10.1017/s0008938900000169. ^ Lackey, Scott (1995-10-30). The Rebirth of the Habsburg Army: Friedrich Beck and the Rise of the General Staff. ABC-CLIO. p. 22. ISBN 9780313031311. Retrieved 28 May 2012. ^ "Austria-Hungary", Encyclopedia Britannica 1911. ^ Sabino Cassese; Armin von Bogdandy; Peter Huber (2017). The Max Planck Handbooks in European Public Law: Volume I: The Administrative State. Oxford University Press. p. 294. ISBN 9780191039829. ^ István Bibó (2015). The Art of Peacemaking: Political Essays by István Bibó. Yale University Press. p. 208. ISBN 9780300210262. ^ Eric Roman (2003). Austria-Hungary & the Successor States: A Reference Guide from the Renaissance to the Present European nations Facts on File library of world history. Infobase Publishing. p. 401. ISBN 9780816074693. ^ Flandreau, Marc (April 2006). European Review of Economic History. 10. Cambridge University Press. pp. 3–33. ASIN B00440PZZC. 1361-4916. ^ "Austria-Hungary" in the Encyclopædia Britannica, 11th ed. 1911. ^ "évi XV. Törvénycikk az államadósságok után a magyar korona országai által vállalandó évi járulékról". Archived from the original on 2007-11-16. Retrieved 2017-01-01. ^ Cornwall, Mark. Last Years of Austria-Hungary: A Multi-National Experiment in Early Twentieth-Century Europe, 2nd ed. Exeter: University of Exeter Press, 2002. ^ Seton-Watson, R. W. (1925). "Transylvania since 1867". The Slavonic Review. 4 (10): 101–23. Cornwall, Mark (2002), Last Years Of Austria-Hungary: A Multi-National Experiment in Early Twentieth-Century Europe (2nd ed. ), University of Exeter Press . Seton-Watson, R. W. (1939), "The Austro-Hungarian Ausgleich of 1867", The Slavonic and East European Review (19.53/54), pp. 123–40, JSTOR 4203588 . Seton-Watson, R. W. (1925), "Transylvania since 1867", The Slavonic Review (4.10), pp. 101–23, JSTOR 4201928 . Taylor, A. J. P. (1952), The Habsburg Monarchy, 1815 – 1918: A history of the Austrian Empire and Austria-Hungary., New York: Macmillan . Tihany, Leslie C. (1969), "The Austro-Hungarian Compromise, 1867–1918: A Half Century of Diagnosis; Fifty Years of Post-Mortem", Central European History (2.2), pp. 114–38, doi:10.1017/s0008938900000169, JSTOR 4545523 . Sowards, Steven W. (23 April 2004), Nationalism in Hungary, 1848–1867. Twenty Five Lectures on Modern Balkan History, Michigan State University, retrieved 19 March 2009 .